Well after several years of riding my mountainbike on the normal road, I finally made a step in a new direction! Today I ordered a new bike, but this time a road race bike!! Making a correct choice is hard, because there are so many brand with beautiful bikes and I had to consider my budget! In the end I ended up with an aluminium frame instead of a carbon one, but upgraded to a better group for crank and shifters. 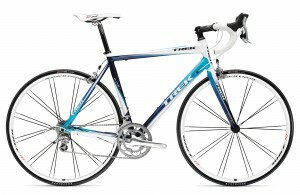 The bike I’ve ordered is the Trek 1.9 with the Shimano Ultegra group. Next week I can get the bike from the dealer! Posted on March 14, 2009 Categories CyclingTags Shiman, Trek1 Comment on Cycling future!